As a researcher I am interested in animal communication, especially animal signals and displays. I conduct research on this topic in the field and in the lab, using observational and experimental methods. In the visual domain I work primarily with color signals, where I ask questions about signal production ("What pigments and reflective structures are responsible for the colors produced? "), signal perception ("How do the colors appear to the animals on which they are displayed? "), signal function ("What information do the colors convey to the intended receivers? ), and signal evolution ("How do factors such as habitat illumination and predator vision influence the evolution of the colors?"). 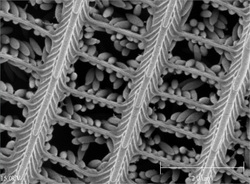 I address the above and related questions using a variety of techniques, such as spectrometry, electron microscopy, chromatography, computational visual modeling, experimental 'playbacks', and field observation. 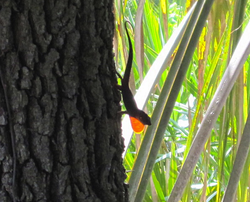 I also conduct research on motion signals ('headbob' or 'push-up' displays) in lizards, where I ask questions such as "How do these displays vary among and within related species? ", and "Can individuals use these displays to discriminate their own species and population from others?". 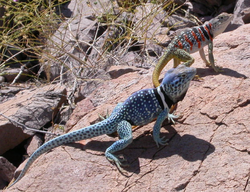 I document details of the motion displays using digital video recording and image analysis software, and use robotic lizards to probe the sensitivity of subjects to motion (and color) variation in their displays. 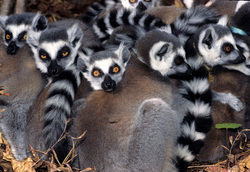 Some social species (like ringtailed lemurs) convey specific information in their 'alarm calls' about the class of predator presenting a threat, whereas other species lack this specificity. The abundance of gray squirrels on the FSC campus provides the opportunity to ask questions like "Do gray squirrel alarm calls indicate anything specific about the type of threat present?" and "Can individual squirrels be distinguished by the structure of their alarm calls?" photo of Crotaphytus dickersonae near Bahia Kino, Sonora, Mexico by Will Wells; photo of ringtailed lemurs at the Duke Lemur Center by David Haring.